Bone marrow is a unique, creamy substance found lurking inside long, large bones — like a tube inside a hard shell of bone. 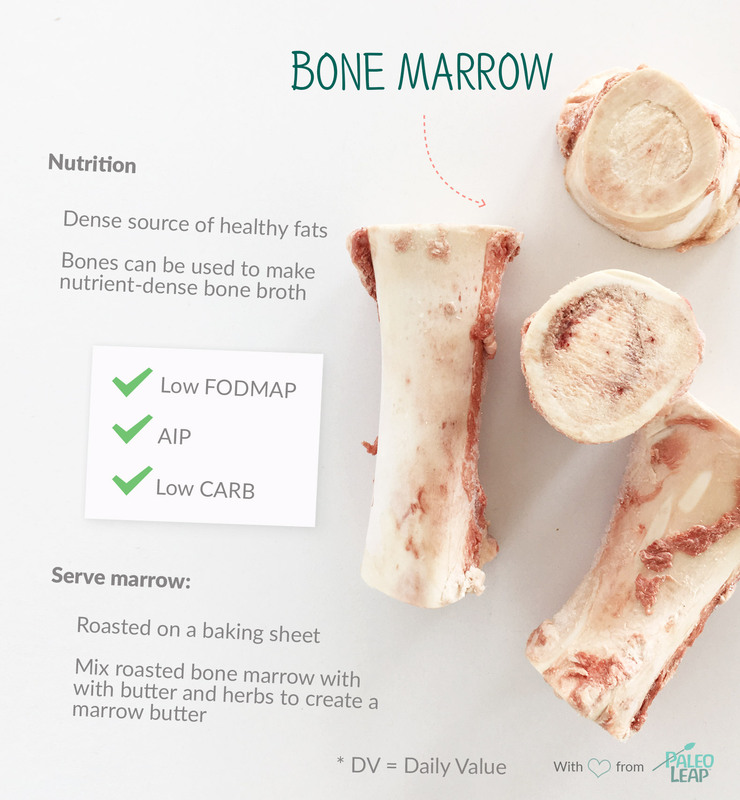 While the nutrition facts for bone marrow have not been thoroughly researched and published, marrow is indeed full of healthy fats. Non-muscle meats like organs and bones are known to be very nutrient dense. In fact, many traditional cultures cherished the marrow and organs of animals, and instead gave the muscle meat to their dogs. One of the most popular ways to enjoy bone marrow is to place bones on a baking sheet and roast for 15 minutes at 400 degrees. You can enjoy marrow as an appetizer spread on a Paleo, grain-free cracker or dipping chip. You can also make a nutrient-dense beef broth or beef stew using marrow bones. When the bone broth or stew is finished cooking, remove the bones and scoop the marrow from the bones and spread on a Paleo cracker. Orange dots show how 1 ounce of bone marrow fits into the typical nutrient profile of a Paleo meal. GRASS-FED: Purchase marrow bones from grass-fed animals, when possible. Look for thick, broad bones that contain lots of marrow inside. INEXPENSIVE: Luckily, bones remain fairly inexpensive to purchase. Grass-fed bones may cost a bit more, but it’s well worth the few extra dollars or cents. TYPE: Beef bones are the most typical marrow bones, but bones of any large mammal like deer, elk or caribou will have marrow inside. Place bones (marrow side up) on a baking sheet and roast for 15 minutes at 400 degrees. Scoop out the marrow and serve on a salad or veggies. Use your leftover roasted marrow bones to make bone broth. Roast bone marrow, scoop out marrow, mix with butter and herbs to create a marrow butter. Make a beef stew with a mix of marrow bones and bones with a bit of meat on them.